The first goal of our school is to live and teach the Catholic doctrines of Jesus Christ. 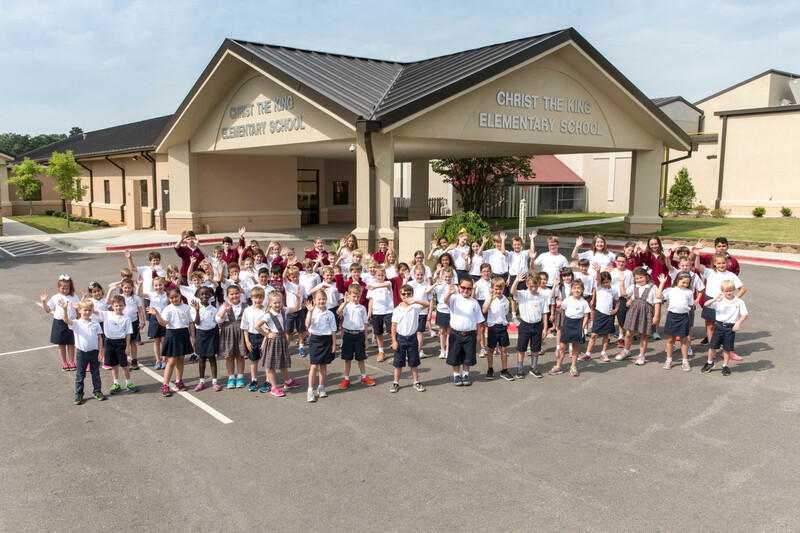 In addition to the Religion curriculum, Christ the King Catholic School focuses on many aspects of our Catholic faith. Many of our Catholic students prepare for Confirmation during their 8th grade year. In addition to Sunday night classes which involves small groups, speakers and one-on-one instruction, students also complete service hours in preparation for Confirmation. Our 2nd grade students also prepare for a special sacrament, First Holy Communion. Second graders receive instruction during class in preparation for this sacrament. Our 2nd and 8th grade students plan activities together throughout the year through our Guardian Angel program. Students, teachers and parents fill the church for All School mass on Fridays. Students participate in many aspects of the mass, including singing in the choir or participating as an altar server, gift bearer, lector or usher. Students also pass our Vocations Chalice poster from one class to another every Friday. Students spend extra time in their class during the week to pray for vocations. Many Feast Days and Special Masses are celebrated throughout the year including: Blessing of the Athletes Mass, Guardian Angels Mass, All Saints Day, Feast of Christ the King, Feast of the Immaculate Conception, Grandparents' Day Mass, Ash Wednesday, The Crowning of Mary and the 8th Grade Farewell Mass. Each of these masses is celebrated in a special way involving our students. In addition to Feast Days and special masses students are also involved in the Living Rosary, First Grade Christmas Pageant and 5th Grade Stations of the Cross.